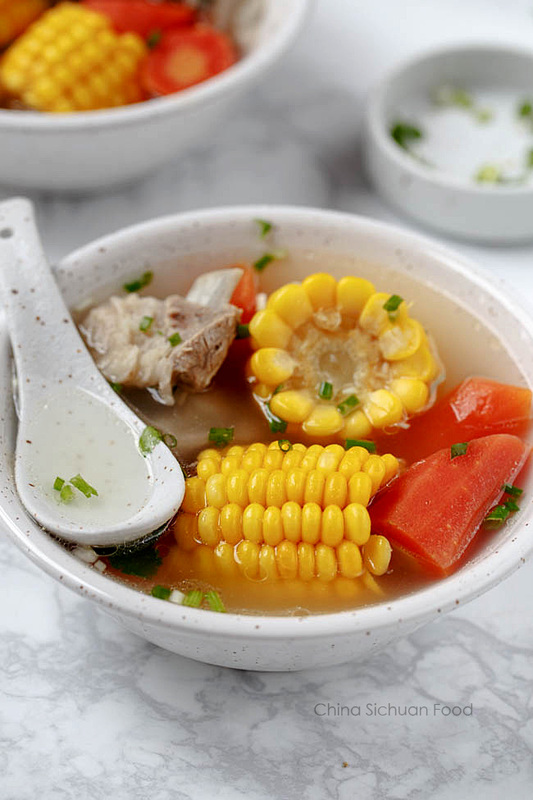 Healthy and summer friendly pork and corn soup. 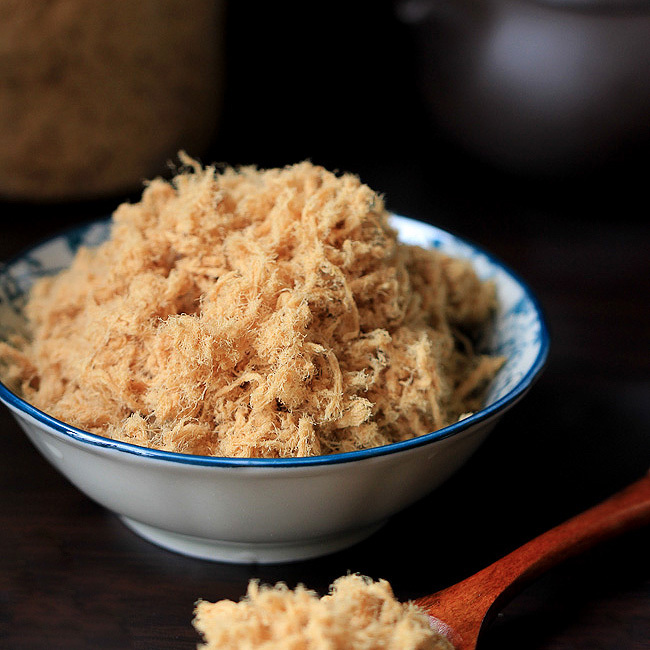 Before moving to Guangdong province, I have never thought that slight sweet soup can be so delicious. We usually cook soups with churchy but less flavored root vegetables like white radish and lotus root in my hometown. 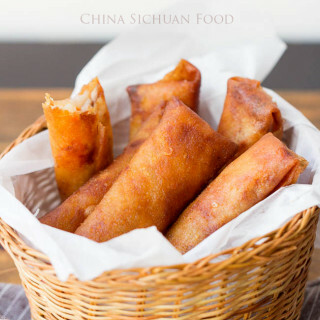 Sweet ingredients include corn, red dates, dried longan are usually not included. But combination of different tissues make this soup so easy but yummy. 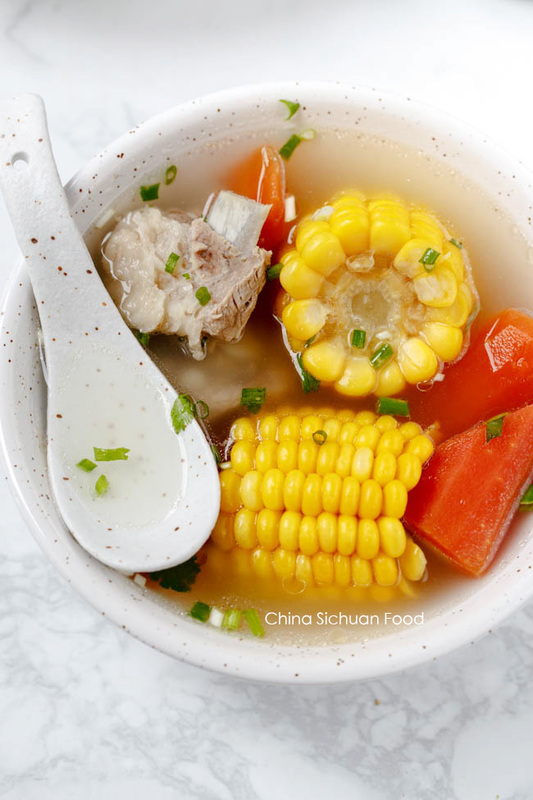 Sweet corn provide a very faint sweet taste to the soup base, not overwhelming at all. Along with the carrots, the soup is quite unique and light. So I believe it should be one of the best soup to serve in later Spring or earlier summer. 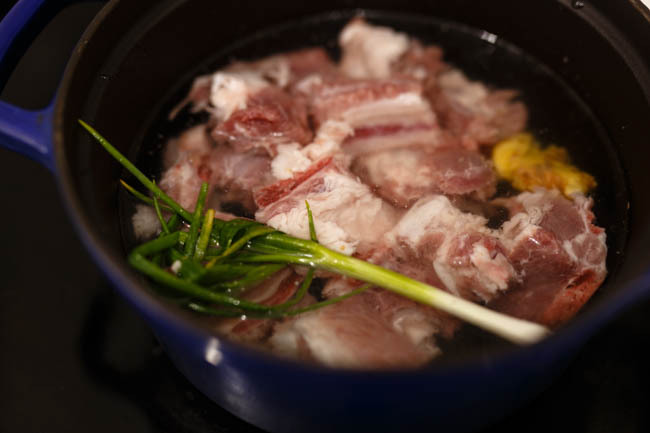 To make a heavier soup with more oil in winter days, replace ribs with large bones. 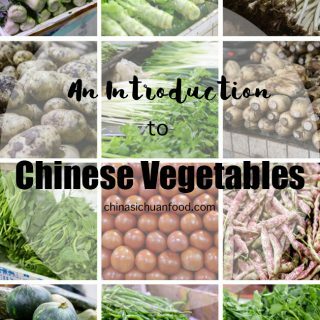 We have lots of yummy dishes in Chinese cuisine use very basic and humble ingredients include soy sauce noodles (阳春面), tomato egg drop soup (番茄鸡蛋汤), shredded pork stir fried with green peppers (青椒肉丝), pepper chicken (鲜椒鸡丁). It is all about combination and highlight each other. This is another example. At least try once, you will be amazed by the unique taste of the soup. Ask your butcher to help you cut the ribs into small sections. Add the ribs in a pot with enough water. 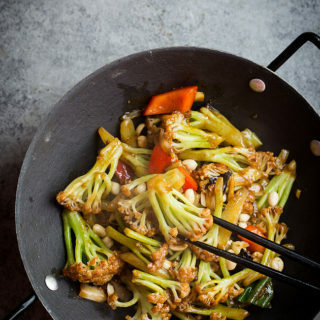 Add 1 scallion and ginger and then cook for 2 to 3 minutes after the water boils. Clean and drain. This is quite important to make the soup clean and lighter, since we remove the extra oil along with the dirts. Place the cooked ribs in a high cooker, add corn and carrots. Simmer for 1 hour after boiling or use soup procedure if you are using a high pressure cooker. Add salt to taste and serve with chopped scallion and coriander. Ribs are extremely popular in Chinese cuisine. 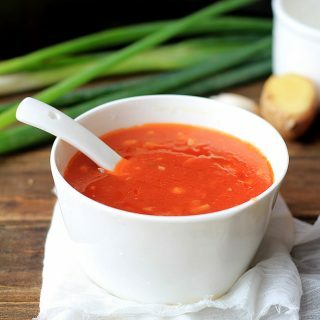 It provide a light soup base for soups and tender meat for braised dishes. 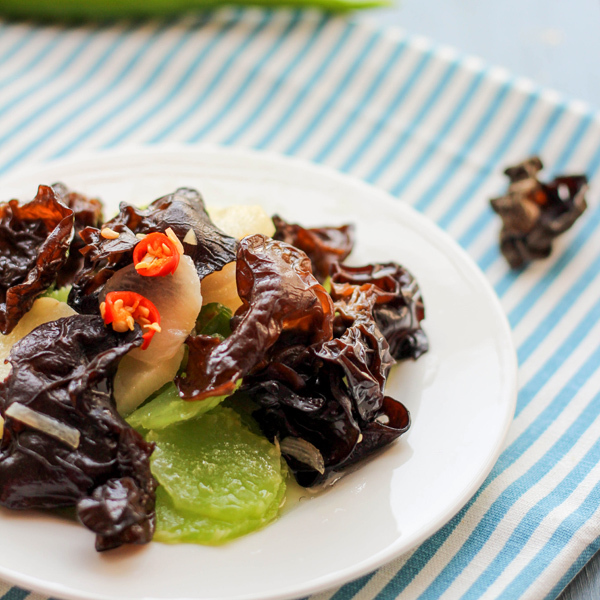 If you love to cook ribs, there are some other Chinese rib recipes you can try. 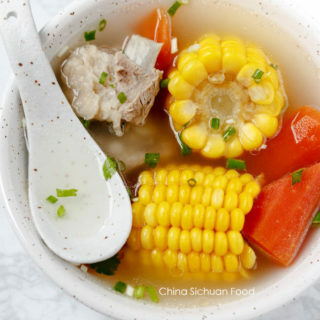 Light and summer friendly pork and corn soup. A sweet savory soup with a unique taste. Ask your butcher to help you cut the ribs into small sections. Add the ribs in a pot with enough water. Add 1 scallion and ginger and then cook for 1 to 2 minutes after the water boils. Clean and drain. 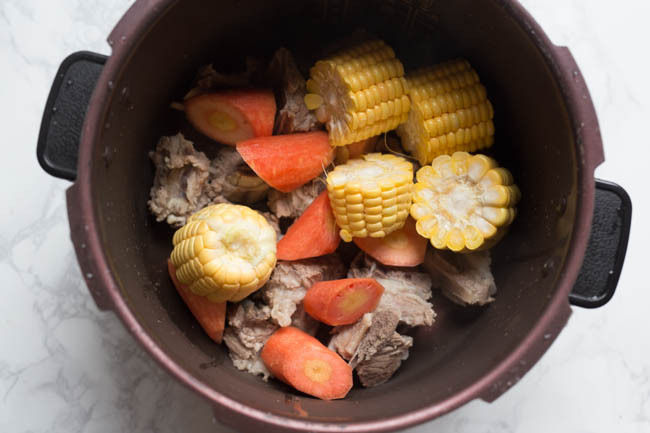 Place the cooked ribs in a cooker with water, add corn and carrots. Simmer for around 1 hour after boils or use soup procedure if you are using a high pressure cooker. what do you mean by “big bones”, the ones from the leg? 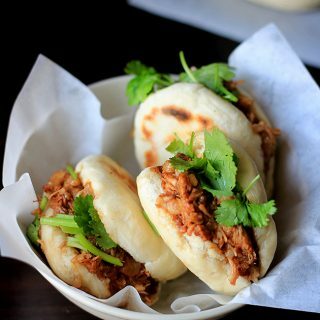 Do you use them with, or without the meat (and skin) for this recipe? Ops, Andreas. I made it so horrible. It should be ginger definitely. In winter days, I use big leg bones, usually with a thin layer of meat but no skins. That type of bone is mainly sold for soups. Don’t worry Elaine. Those little spelling mistakes are probably as common as getting some little cuts and burns in the kitchen. Even more so when publishing such an amazing amount of recipes as you do, and that in a language that’s so different from your native one. Anyhow, I tried the soup and really liked it. I used ribs, but I can get pork “Soup Bones” here as well albeit they are typically cut into smaller pieces. So thank you for that piece of information. Unfortunately I had to use precooked corn cobs as I get fresh ones only in late summer and early autumn. But as I said, the soup tasted great nonetheless. I have been looking for a corn soup I tried years ago that is creamy with ham in it. 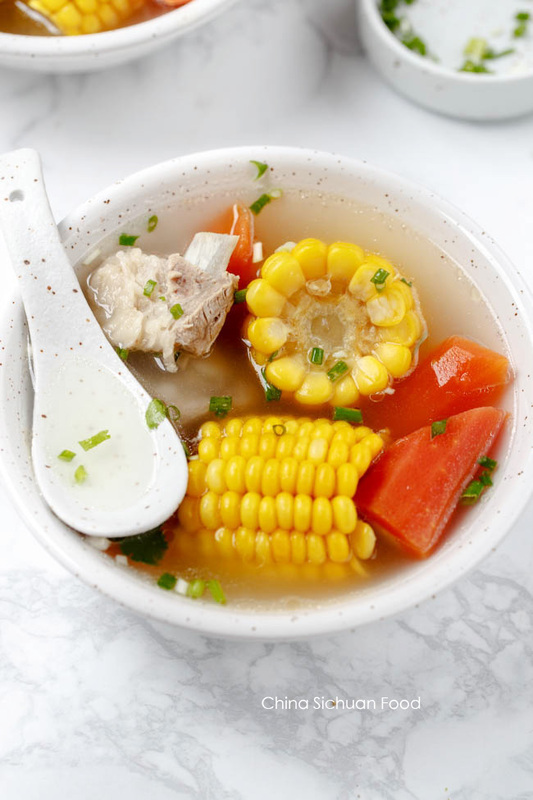 Its made with corn, and chicken stock for the base. Have you a recipe? I made this recipe with about 6 pounds (2 3/4 kg) of pork spare ribs. 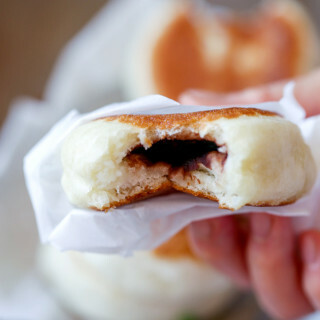 The quantities of the other ingredients were adjusted accordingly. The soup came out very good. Some members of my family added soy sauce to the soup and they also enjoyed it more. I think I must have overcooked the ribs because most of the meat fell of the bones. The main point is the meat was soft and tender. Another successful recipe from Elaine’s Kitchen that I was happy and delighted to make. Thank you Elaine for all the wonderful recipes that I made from your kitchen. Thanks Steve for your comment. 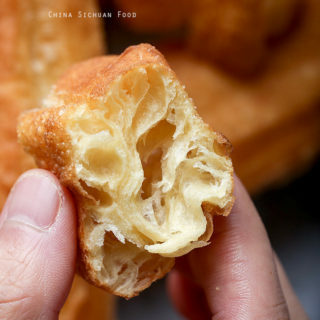 Yes, it is the real example how simple ingredients create good flavors together. Gold to know you loved it. Happy cooking! !